Have you ever wondered what our Fins are passionate about outside of the office? Take a peek into the world of our own Kevin Burnett. My goal is to hike all 50 state highpoints within the United States. I’m in the Highpointers Club which contains about 5,000 people around the US that want to reach the top of every single state in the union. Does reaching the tallest point in each state sound fun to you at all? It should! When hiking highpoints you get to be outdoors, meet great people along your travels, have a reason to be in shape, and get the ability to see the beauty of the world around you in a way that very few people do. There isn’t much that beats being outdoors for me. Perhaps it’s because I sit behind a computer all day, which is usually not outdoors, and the outside is simply me longing for what I don’t have. I know the grass is always greener on the other side of the fence, but when you’re outdoors, you get to be free of so many cares and concerns that come with the day-to-day work. Reports and status meetings are not present when I’m outside, though the same could be said of any vacation. However, when you’re outdoors, especially up in the mountains, you are completely off the grid due to the fact that cell signals don’t always breach the wilderness (currently). When on vacation I can still see emails and perhaps still be tempted to check on the progress of things while I’m away, thus completely ruining the purpose of me being away! In the mountains and on a highpoint, though not always the case, that temptation doesn’t exist, and I can truly relax and enjoy my surroundings. In addition to being able just to relax, you meet some amazing people while out on the trails, especially at highpoints. Unless you’re in a rural area or other location where the highpoint is easy to reach, you won’t just find your average Joe on the trails. Every single person you meet has a good head about them, cares for others, and seeks to be good stewards of the environment they’re hiking through. I can greet any person passing me and almost always have a smile returned and a warm conversation if I wish. They think like you and want to be there for the same reasons you do. Twice while out hiking highpoints, someone in my party left their two thousand dollar camera sitting some place and forgot about it (incredulous I know). In most settings, that camera is gone and you’ll never see it again, except perhaps if you’re lucky enough to come across in a pawn shop. But on the highpoint trali both times we went back to find it and no one had taken it! At one point we were over 300 miles away before we realized the camera was missing, so we drove all the way back fully expecting weather or person had interfered. Instead, another highpointer had stopped by and found the camera and turned it in to the police station for safe keeping. Both he and the police knew the caliber of the camera and its worth, but the highpointer respected his fellow hikers enough to know that it would be sorely missed. While some highpoints are drive-ups, such as Mount Sunflower in Kansas or Timms Hill in Wisconsin, others are difficult challenges, such as Mount Rainier in Washington or Mount McKinley (Denali) in Alaska. One simply doesn’t just walk up one of these mountains without any type of training or preparation because death would be a very high probability. This preparation includes intense physical training to make sure you are in shape and strong for the challenge that lies ahead. I’m a guy that doesn’t really care too much about losing weight and I love to eat, so staying fit isn’t the highest thing on my priority list. However, there have been two times where I was not able to reach the summit because I wasn’t prepared enough for it. Nothing, and I mean nothing, makes me angrier than when I prevent from doing what I want to do. And nothing motivates me more than a failure, so I make it a high priority to be prepared for whatever I need to do, which helps me stay in shape where all other things fail. Plus, health and physical fitness have many other benefits in life as well, so it’s really a win/win. There aren’t many people that get to see the sights you get to see while hiking, but especially on highpoints. My family accompanies on these hiking escapades and we have a saying: “You have to go there to get there.” What we mean is that you usually don’t stumble upon a highpoint; you are intentional about your destination and your goal. 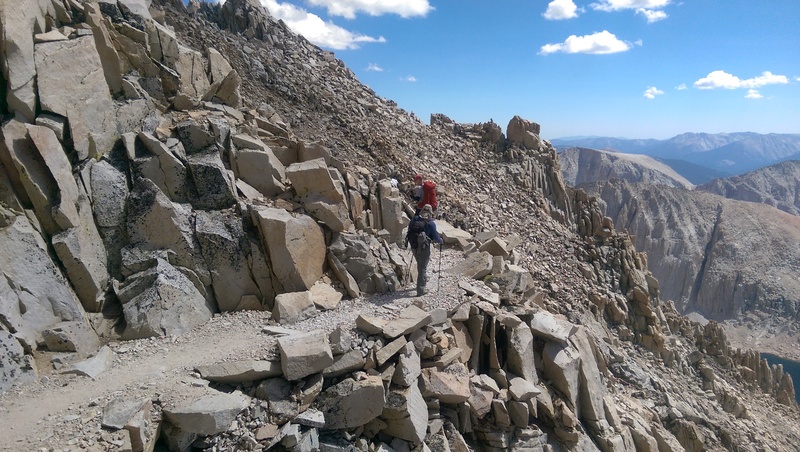 Some hikes are not the prettiest are particularly nasty tail-kickers, such as Boundary Peak in Nevada, but there was beauty in the trip to get there, the comradery built while hiking, and the joy of reaching the top and accomplishing your goal! There’s nothing like the feeling of reaching the top and knowing you have conquered the mountain (at least until you remember you have to come back down!). I would recommend it to everyone! But perhaps the best part are the lessons you learn about yourself. You get to discover how you see beauty, learn to really appreciate everything and one you come in contact with, and ways to push through the tough times when you’d rather end your pain. When you’re climbing up a 5,000 foot slope and you want to quit 30 minutes into it, you learn to push through and to keep plodding along towards the top. It’s very similar to a marathon where you know you can keep going despite what your body is telling you (which happens later than 30 minutes into a long hike); you just have to overcome that barrier and keep pushing. Celebration at the top is great and gives you an energy boost, but you learn you are now halfway back to where you need to be! Going down is not in any way easier than going up, so you learn to conserve your strength and plan properly for the aftermath of your accomplished goal. Often in our lives our goals are one step towards the path of whatever your mission happens to be. You can’t be satisfied with stopping at one goal, but mush continue onward; they are checkpoints along the route to your true and final destination. So have I convinced you to be a highpointer yet? I hope so, but if not, I encourage you to get out and enjoy the sites around you wherever you are. We must be good stewards of this world we live in and need to appreciate the beauty in the surroundings in which we find ourselves. Come join in on the fun! You’ve been missing out for far too long!